Wildstorm was an interesting comic imprint. Made by Jim Lee, it started out at Image, was bought by DC, featured a variety of folk writing for it, had a world-destroying event it tried to make stories out of, and then was folded into the mainstream DC-Universe for the New 52 before that was mostly forgotten with, "Rebirth," not having any Wildstorm characters featured right now as far as I recall. One person who wrote a bunch of comics for Wildstorm was Warren Ellis, with his cerebral, "Stormwatch," and its massively successful (and more focused on explosive action) follow-up "The Authority," being remembered fondly. So, Wildstorm was basically dead, and then it was announced the world was getting a weird and new re-launch with everything heavily re-imagined by none other than...Warren Ellis! With the art of John Davis-Hunt as well we would get a new series that had characters we maybe recalled, but very different in a whole new world. Basically, something friendly to new readers but with some of the old concepts and names. Not so much a reboot as a drastic re-imagining. Could such a thing be good and work however, or show-up as a huge mess? Well, the fact that they got Warren Ellis should assure you that there ain't much of a need to worry. 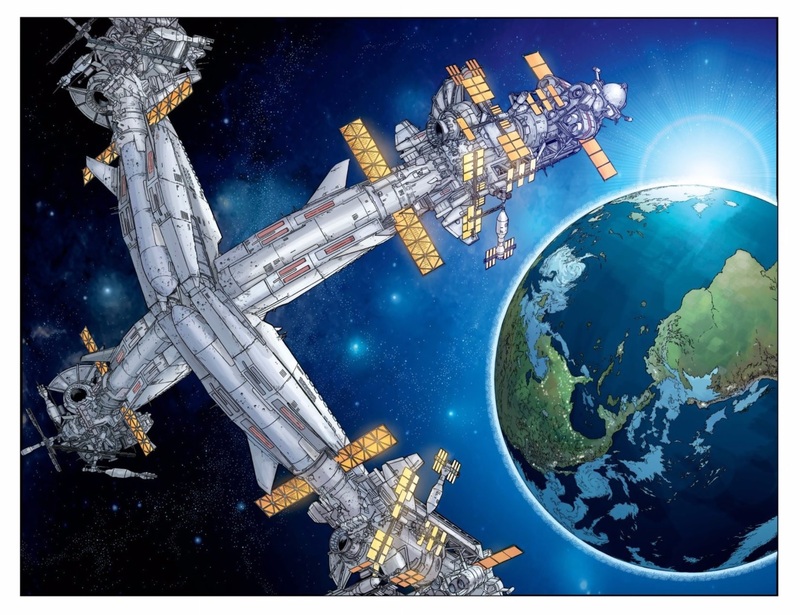 Yes, "The Wildstorm," is quite good. 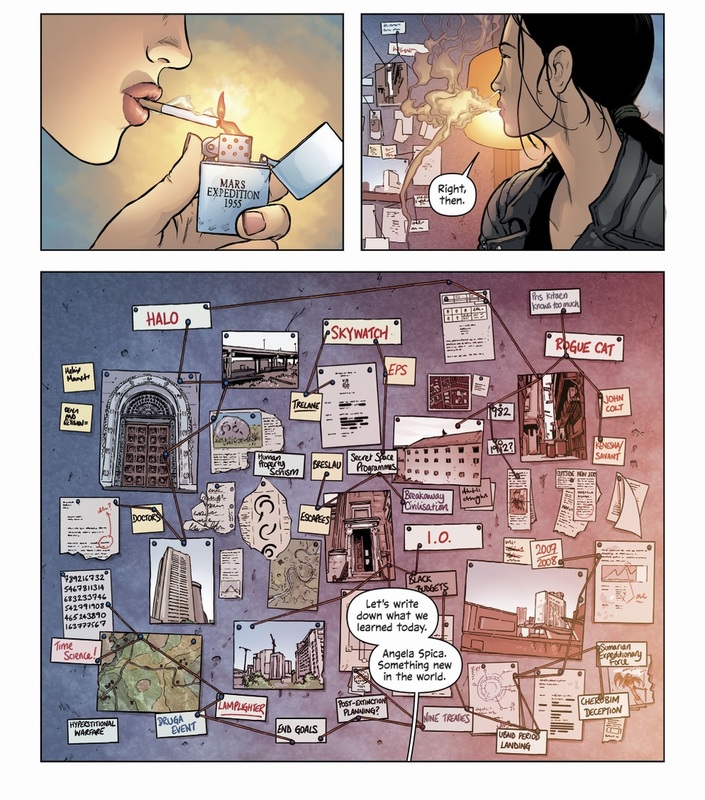 It is more in-line with Ellis' earlier, "Stormwatch," stuff, focusing on secret organizations that try to run the world and all the complexities that entails. This isn't the hopeful world we had near the start of the new millennium however, this is 2017 and the world is a dark and depressing place, just as this comic reflects. 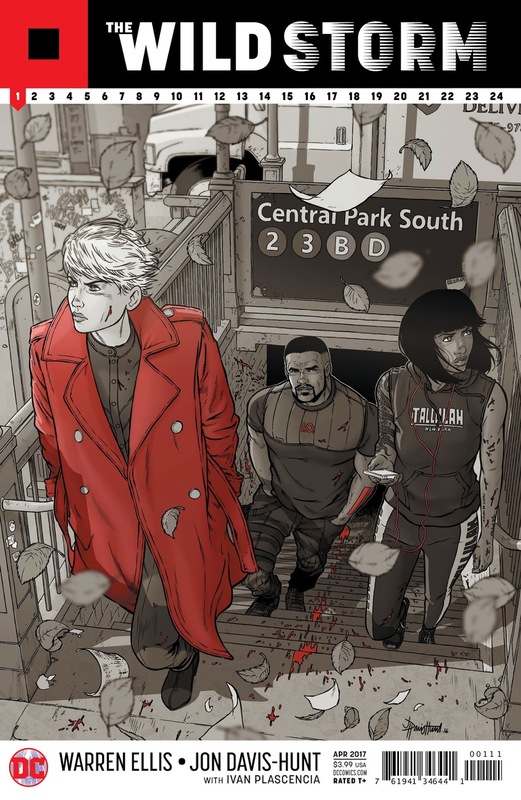 "The Wildstorm," is a 24-issue series split into segments with various spin-offs that occur every once in awhile. 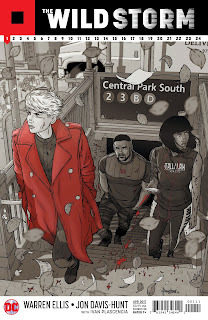 Besides the handful of comics that will spin-off this is a pretty self-contained kind of comic-world, not something as big and multi-volume as the old, "Wildstorm books." I like that though, and have found this first arc of, "The Wildstorm," very enjoyable. Basically, as is explained a couple issues in, there are two major organizations that run everything. International Operations runs most of the planet of Earth, and Skywatch gets space. There is a weak peace between these groups and some outside parties might cause all the treaties to fall apart and war to break-out. A tech-whiz named Angelia Spica has stolen a lot of tech from IO, some of which they had already stolen from Skywatch, so clearly some trouble is afoot. Also, there are space aliens, because why not? It also is nice to have John Davis-Hunt providing such nice artwork, with his clean and precise lines giving everything a sharp and severe look. Whether Ellis is giving us a new riff on WildCATs, Michael Cray, Henry Bendix, or countless other characters it is fun to see the man who arguably helped make these characters so popular the first time return to them with a new lens to skew everything into something drastically different. As I would only say my familiarity with the old Wildstorm Universe is minimal-to-kinda-decent I can say without too much hesitation this book is quite friendly to new readers and is also fun for anyone who has even a passing familiarity with the old Wildstorm books such as myself. There was not an issue in August as it was a planned, "Skip month," Ellis previously mentioned in his weekly newsletter I subscribe to so I look forward to issue #7 during this month and reading what the latest story-arc holds! You can buy issues of, "The Wildstorm," on eBay and at all finer comic shops.